Well, this is it. The final ever reveal for the Secret Recipe Club! My first post for SRC was back in February 2013 when I made a delicious Chicken Tikka Masala. We love Indian food but it was the first time I'd ever made that recipe myself. And it was amazing! I've loved getting a peek inside other people's kitchens, trying out recipes that I would otherwise have never even heard of, let alone tried. And I think that has been the beauty of SRC. We all come from different parts of the world, have different tastes, different families and yet, we have all been brought together by our love of food. For this final month, I was assigned Savory Moments by Amy, a stay at home mum of twins from Western NY and passionate foodie, and I knew immediately I would find some great food. This is exactly why I cook and blog too. I think so many of us are time-poor and have been seduced by the ease of convenience foods, which in reality are chemical-laden, nutrient-deficient filler foods, setting us up for a lifetime of ill-health. To grow your own food, even if it's just having a few pots of herbs on your windowsill, to buy what is seasonally available and then cook it from scratch is so rewarding and the best way of setting up a culture of good food in your family. We are a predominantly gluten, dairy and refined sugar-free household these days, and I found loads of recipes on Amy's blog that fit the bill, or that could be easily adapted. Some of my favourites were the Turmeric and Honey Roasted Chickpeas, Avocado Chocolate Pudding, Lemony Raw Kale Salad, Roasted Sweet Potatoes with Spinach and Cranberries and Bog salad with maple vinaigrette to name just a few. When it came down to it though, I decided to make something just for my boys. I've been in a bit of a baking rut recently, so wanted to try something new. So it had to be Amy's Salted Peanut Butter-Honey Cookies! 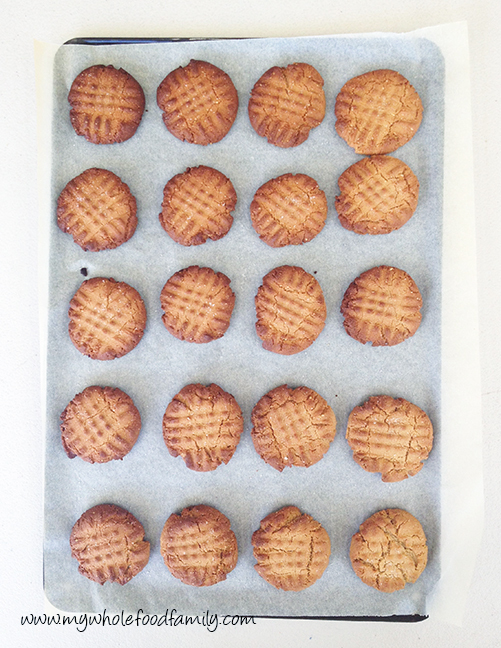 My only change to the recipe was to use buckwheat flour instead of the wholemeal, to make them gluten free. I also made them smaller than stated, getting 20 cookies out of the batch instead of the 14-16 Amy suggested. I baked them for just 10 minutes but even that was too much, so if you make them small I would suggest just 8-9 minutes! This is a great recipe to make with kids - just 5 ingredients, mix, roll and flatten with a fork. Mr 3 was my very willing helper with these and he was hovering close to taste the first one. My boys absolutely loved these and the entire batch went in one afternoon tea. For the record I had just 2, and the other 18 were devoured by the 3 of them, along with a glass of cold milk each. I think that makes them a winner! Preheat oven to 180 degrees Celsius / 160 degrees fan-forced. In a small bowl whisk together the flour, bicarb and salt. In a large bowl beat together the peanut butter and honey until smooth. Add the dry ingredients into the peanut butter mixture and stir until well combined. Roll tablespoons of mixture into balls and place on the prepared trays. Gently press down with the tines of a fork to make a criss-cross pattern. Sprinkle with a little extra sea salt. Bake for approximately 8-10 minutes, until they just begin to turn golden brown. Thank you Amy for a great recipe, we will definitely be making them again! What a great idea for using some of my buckwheat flour, I bought a bag of it some weeks ago, but didn't use it much. And thank you for your wonderful Fruit Mince Pies, we all love them so and I am sure I will be making them again and again. Thanks for the kind words and I'm glad you enjoyed the cookies! 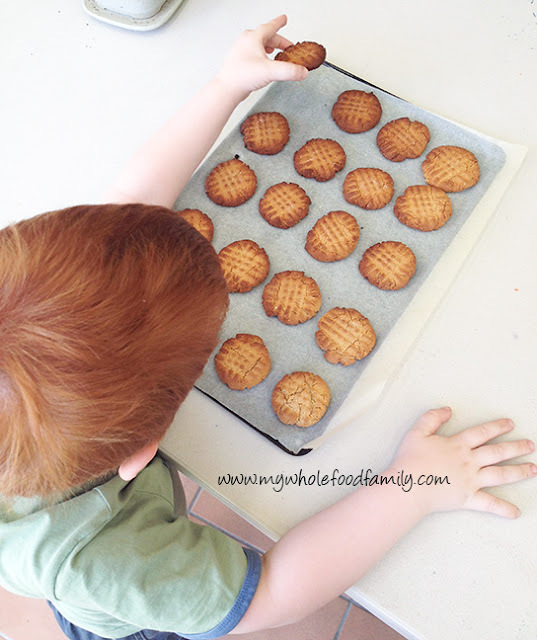 Such a fun cookie recipe to make with the kids! I love that they are gluten, dairy, and refined-sugar free. 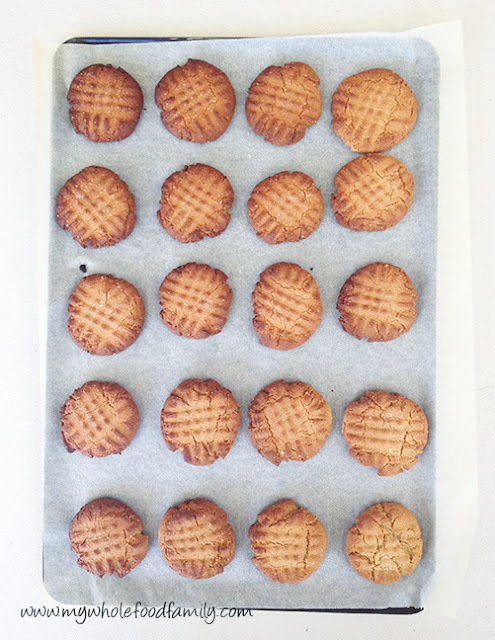 i love how simple and healthy peanut butter cookies can be! love the honey in this recipe. Everyone loves peanut butter cookies! Great SRC recipe! 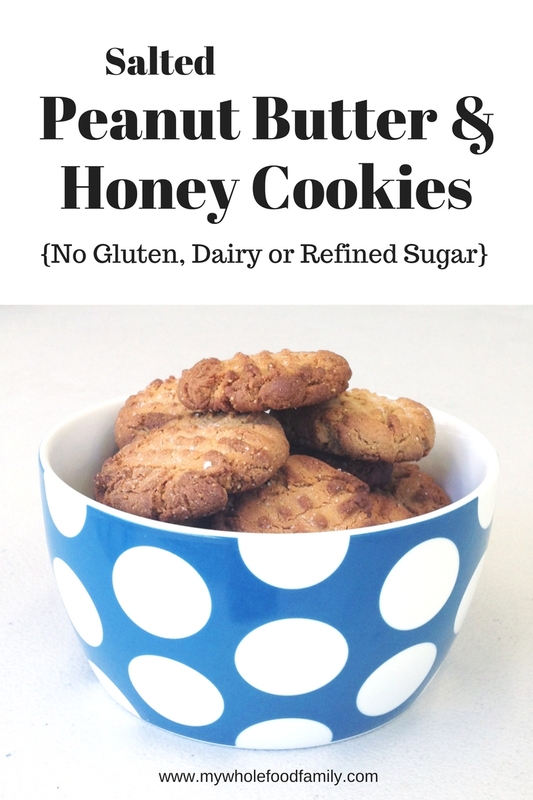 Love the addition of honey in these cookies!